A man has been jailed for six years for stabbing a fellow diner 25 times in a restaurant toilet. 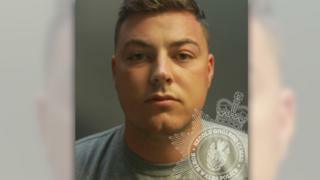 Hotel worker Dalton Morrissey, 26, of Llandudno, Conwy, was cleared of trying to murder Gareth Edwards at Hickory's Smokehouse, Rhos-on-Sea, last August. But he admitted wounding with intent and possession of a blade at Mold Crown Court. Mr Edwards, 32, suffered a punctured lung and received 50 blows in the 'frenzied' drunken attack. He had been celebrating a friend's birthday at the BBQ restaurant when he was attacked in the toilet with a steak knife. Judge Rhys Rowlands said it was "entirely unprovoked". He told Morrissey: "The only explanation is you had drunk far too much, had become morose and aggressive in drink. It was a drunken total loss of control." The court heard the attack had a "very profound" effect on Mr Edwards, who spent six days in hospital and has been unable to return to work. He told the court: "I genuinely believed I was going to die. My recovery will be a long process. I am fearful of crowded places and being alone." Duncan Bould, defending, said Morrissey was of previous good character and showed remorse. Det Con Jayne Marsden, of North Wales Police, said it had been a "horrendous" attack. She added: "While I am relieved his physical injuries have healed, he'll no doubt carry the mental scars for years to come." Morrissey was also handed an extended licence period of three years.